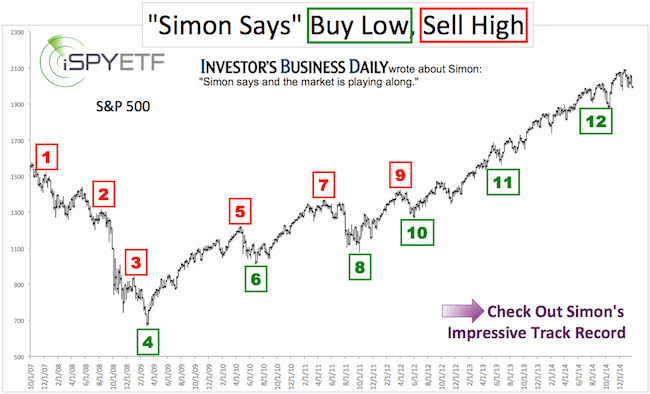 It’s time for an update on the most powerful stock market indicator in recent history – the major market top indicator. This indicator (dubbed ‘secret sauce’) correctly foreshadowed the 1987, 2000 and 2007 market tops. The same indicator also ‘told us’ that the bull market will continue after the corrections of 2010, 2011, 2012 and thereafter. A detailed explanation of this indicator (and why we call it ‘secret sauce’) is available for review here. The October 8 column “The Missing Ingredient for A Major Market Top” mentioned a fledgling bearish non-confirmation (the first one since 2007). 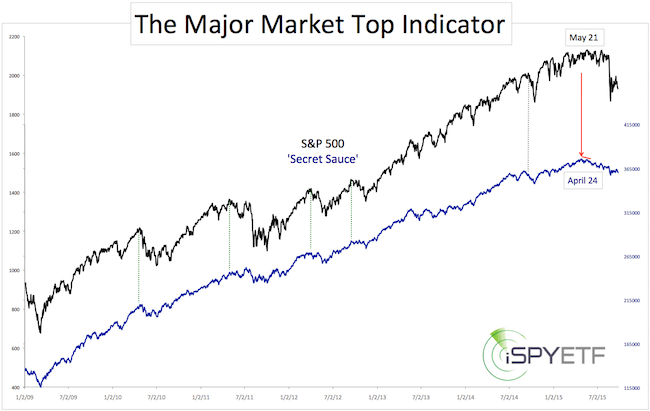 “There is a small bearish divergence between the S&P 500 and the [indicator name replaced with ‘secret sauce’]. As proposed, strong seasonality and the ‘need for a multi-month divergence’ erased the fledgling divergence, and the S&P 500 moved to new all-time highs in 2015. The May 17 Profit Radar Report noted a renewed bearish non-confirmation. “At the latest all-time closing high for the S&P 500 (May 21), 27% of S&P 500 stocks traded within 2% of a 52-week high, while 13% of S&P 500 stocks already lost 20% or more since their latest high. 16.8% of S&P SmallCap 600 stocks were within 2% of a 52-week high. 23% already lost 20% or more. This internal deterioration and indication of buying selectivity is confirmed by [indicator name replaced with ‘secret sauce’] and the percentage of NYSE stocks above their 50-day SMA. Eventually turned out to be August 19 – 24, when the S&P 500 lost 229 points in four days. The updated chart below highlights the bearish non-confirmation noted in various Profit Radar Reports. 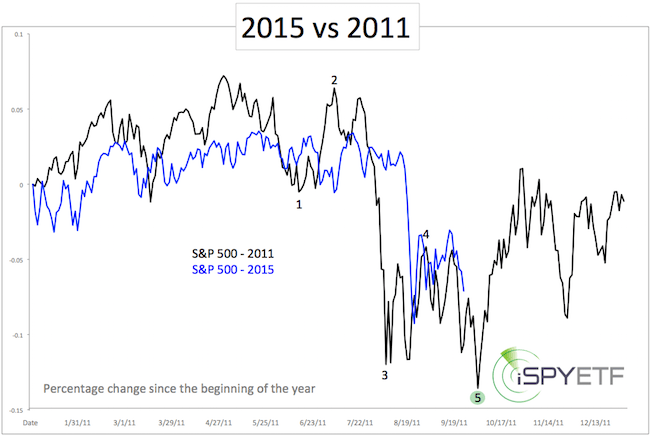 The 2015 divergence is more pronounced than the October 2014 divergence, but not as obvious as divergences seen prior to past major tops (4 – 24 months). Based on the ‘secret sauce’ major market top indicator, the May 21 S&P 500 closing high could mark the last day of the post-2009 bull market. However, the bearish divergence is shorter than all recent historic precedents, so bulls and bears should be careful. Just because the market hasn’t given a conclusive answer to the bull/bear market debate (yet) doesn’t mean we are in the dark. Quite to the contrary, the S&P 500 has been following the path we identified months ago (we call it ‘our script’). What is ‘the script’? The script is a comprehensive forecast (based on literally dozens of indicators and historical statistics) illustrated with one simple chart (read about it here and here). “History: Panic declines, like in August, tend to be followed by a period of testing and another low, or at least a test of the low. Historical evidence: Since 1928, the S&P 500 dropped 10% or more from a 52-week high to a 3-month low, followed by a 3% bounce over 3 days (as was the case as of August 28) 21 times. 10 out of 21 times the S&P 500 tested or violated the low before going higher. 5 times the S&P staged a V-shaped recovery, and six times it eventually moved into a new bear market (3 of those 6 times the S&P rallied first before heading lower). Seasonality: Late September/early October is one of the worst times for the S&P 500 in terms of seasonality (click here for S&P 500 seasonality chart). The S&P 500 ended August with a loss of more than 5%. Since 1928, that’s happened 13 times (not including August 2015). The September after a 5% loss August was positive only 4 out of 13 times. The 2011 script foretold a July/August sell off followed by weeks of sideways trading and another low. In short, our dashboard of indicators suggested that 2015 will follow the script of 2011. A picture says more than a thousand words. For continued updates and out-of-the-box analysis, sign up for the Profit Radar Report. Is the S&P 500 Forming a 2007-Like Top? That’s right. My favorite analogy has been 2011 (click here for more details). Like 2011 (and 2015), 2007 is a pre-election year, and certainly worth a closer look. The chart below compares the S&P 500 of 2007 with the year-to-date S&P. The key feature of the 2007 summer drop is that trade recovered thereafter, and didn’t drop below the 2007 panic low (red circle). The equivalent 2015 panic low is 1,867 for the S&P. Will this level hold? History: When August ended with a 5% loss, the following September was positive only 4 out of 13 times. Triple Witching: Based on Friday’s Triple Witching loss, there was a 72.3% chance stocks will be down this week. 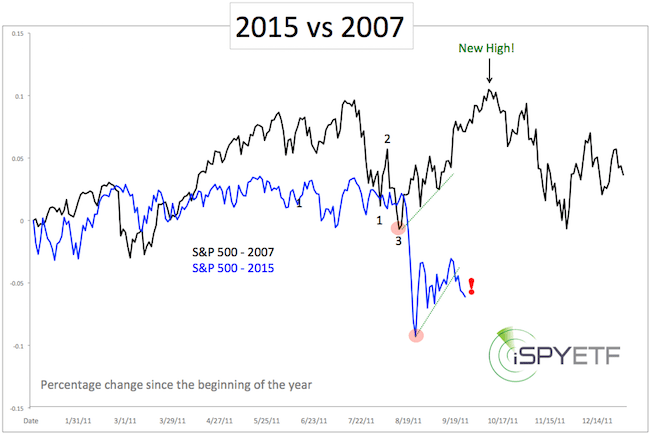 Unlike 2007, the S&P broke the sequence of higher lows (dashed green lines) this week. This doesn’t mean that the S&P cannot soar to new all-time highs, like it did in 2007. I think Q4 stock performance will be more positive than Wall Street expects, but the odds favor a new low (or test of prior low) before a more sustainable rally. There are a number of open chart gaps at higher levels (SPY 195.21 and 199.28) which may get filled, so even a trip to new lows is unlikely to be a direct route. How can we tell if an ensuing rally (when it materializes) has what it takes to move to new all-time highs? The September 20 Profit Radar Report looked at all the facts, including an updated look at the ‘Secret Sauce’ major market top indicator. Will the S&P 500 Re-lapse or Re-cover? There’s a time to speak and a time to be silent. You may have noticed that it’s been kind of ‘silent’ here at iSPYETF. Why? There hasn’t been much new to report since we last looked at the S&P 500 on September 11. The September 11 article “S&P 500 Analysis – The Next Turn” referred to the parallels between the S&P 500 of 2011 and S&P 500 of 2011. Based on this analogy, we expected the S&P 500 to edge higher in a choppy fashion and eventually relapse to retest or break the initial August panic low at 1,867. It is rare for me to focus on just one outcome, but based on literally dozens of indicators and data points, the odds favored a path similar to what we saw in 2011 (updated chart below). Thus far the S&P 500 has followed the outline almost perfectly, and there has been no reason to adjust. While it looks like the S&P is now on its way to re-test or break 1,867, there is no time to gloat or rest either. When things become too obvious, the market has a way of making things interesting and often delivers a curveball. The market is always the final authority, but based on my indicators, we would be interested to buy new lows. Target levels for a tradable price low and the scope of the next rally (bounce or new bull market highs) are available to Profit Radar Report subscribers. An explanation of contango and backwardation (along with the best seasonal VIX signal) is available here (last two paragraphs). In short, backwardation is a condition that either increases XIV or SVXY losses or erodes XIV and SVXY gains while the VIX trades above 20 – 25. The chart below plots the CBOE VIX against the VelocityShares Daily Inverse VIX ETN (NYSEArca: XIV). Another inverse VIX vehicle is the ProShares Short VIX ETF (NYSEArca: SVXY). 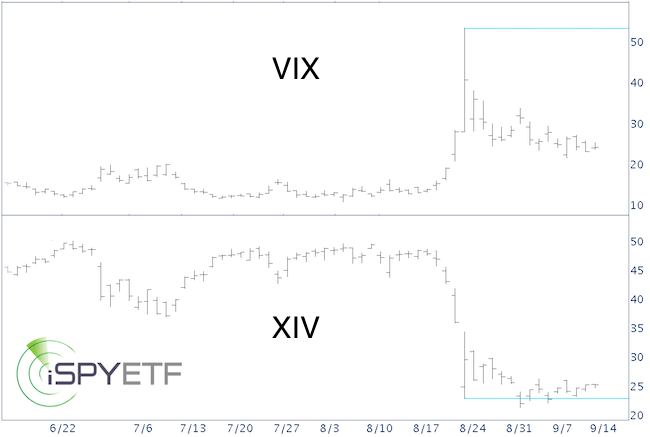 Although the VIX retreated more than 50% since August 24, XIV is up ‘only’ ~10% (SVXY is up ~8%). Welcome to the power of backwardation. Understanding contango and backwardation is vital for VIX investors. Just as backwardation is hurting XIV and SVXY right now, contango will likely benefit them later on this year. The VIX seasonality chart offers strong clues when the next good setup will be. This is the same VIX seasonality chart that triggered a buy signal in early July. Investment advisors and newsletter-writing colleagues are as bearish right now as they were in March 2009, when the S&P briefly struck 666. Yes, a quick 12% drop in 2015 caused the same fear as the biggest financial crisis since the Great Depression. Ok, perhaps (even probably) that’s an exaggeration, but the investment pros (polled by Investors Intelligence) show the same fear now as they did at the end of the financial crisis. No matter how you slice it, that’s pretty remarkable. 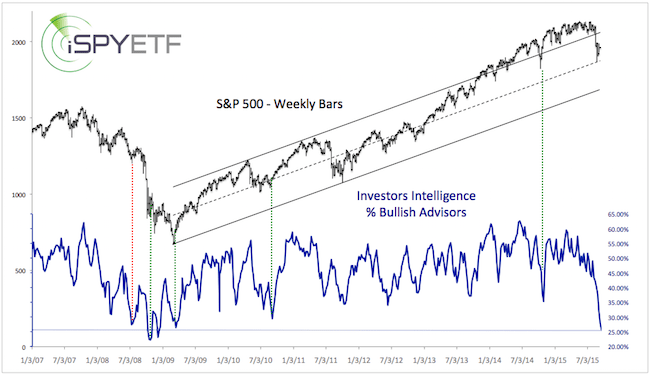 The chart below, which plots the S&P 500 against the percentage of bullish investment advisors, offers a glimpse into advisors’ collective mind. 3 out of 4 advisors recommend staying away from stocks. The dashed green lines mark similar investor sentiment extremes, which were not long-term bearish for stocks. The only potential exception was a somewhat similar reading in July 2008 (dashed red line). But even this one sparked a notable rally before the bottom fell out. Does this mean stocks can’t go any lower? By no means. But a drop below or test of the August 2015 panic lows may be a trap for bears. That’s at least what this S&P 500 template (which also predicted the sharp August selloff) implies. On June 15, I noticed (and wrote) that 2015 is Shaping up to Look a lot Like 2011. In 2011, the S&P 500 fell 20% in July/August. 18% of that loss happened within a 3-week meltdown. The rearview mirror shows a similar ‘crash’ in August 2015. Will the 2011/2015 analogy continue? I suspect it will. Not tick for tick, nothing every does, but reasonably close. The chart below plots the S&P 500 of 2011 (black line) against the S&P 500 of 2015 (blue line). In 2011, the initial low (August 9 at 1,101.54) was followed by a multi-week consolidation and another new low (October 4 at 1,074.77). According to Elliott Wave Theory (EWT), the 2011 decline followed a 5-wave format (see black numerical labels). Elliott Wave Theory is an exotic indicator, and should not be followed blindly, but there are times when EWT can be very helpful. Now appears to be such a time. A longer-term trend change may have occurred (this was not the case in 2011). Regardless, a rally was to be expected after the initial (wave 3) low. There are a number of other possibilities, but at this point there is no reason to complicate matters. If the next moves don’t match our parameters (many of which were already shared with Profit Radar Report subscribers), we’ll adjust. For now, the likely path is the one outlined by the 2011 template: Perhaps more choppy sideways action, and a new low followed by a Q4 rally.